If you like this free game, try Back to Bed. 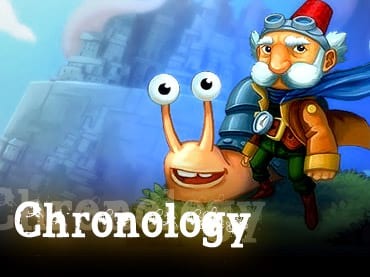 Chronology is a unique blend of platform jumper, puzzle and adventure game where you will guide the Old Inventor through challenging levels. The graphics and animations are truly beautiful and makes this puzzle game stand out of the crowd. You will have to use the special skill of travelling back and forward in time to manipulate objects in order to solve puzzles. Funny characters and level design that makes your brain work hard to figure out the solution. Download Chronology now for free. If you have questions about Chronology game, please contact us using this form.